Dyson DC22 Baby Vacuums | OhGizmo! Don’t let that headline fool you. These new vacuums from Dyson aren’t specifically designed for sucking up babies, though from my experience they’re more than up to the task. The baby moniker simply means these new versions are about 1/3 smaller than the standard Dyson canister vacuum, making them more suitable for smaller apartments. The DC22 comes in either a standard Allergy model or an upgraded Animal model which really only adds a turbine head for working pet hair out of carpets and upholstery. Both models include a washable HEPA filter and a telescoping wand that wraps around the canister for easy storage. 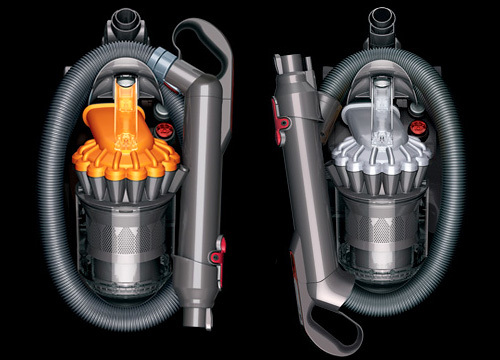 Both vacuums are available for pre-order on the Dyson UK website with the Allergy model selling for about $477 and the Animal model selling for about $557. Then why it is called a baby vacuum?